Marketing Strategy Grid: A marketing strategy integrates an organization’s marketing goals, policies, and action sequences (tactics) into a cohesive whole. I developed this Marketing Strategy Grid is a tool to help you do just that. 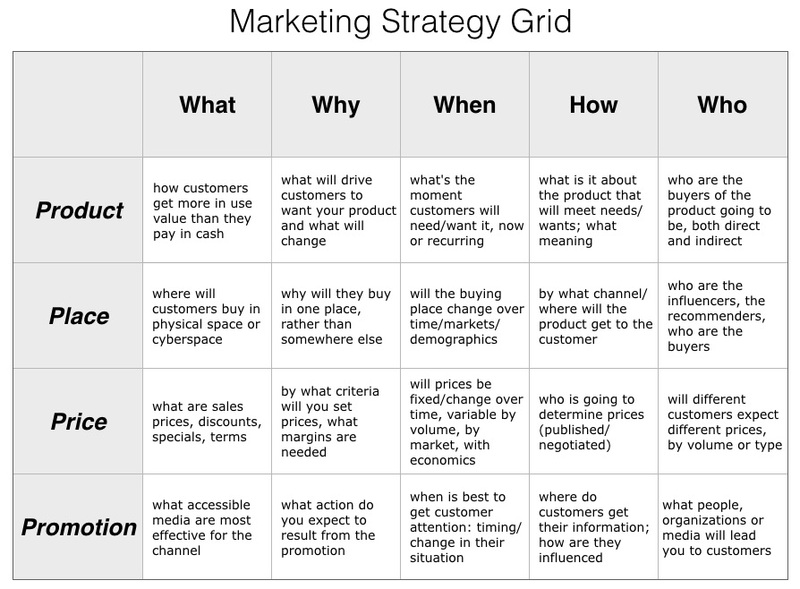 It would be good to draw your own table based on the Marketing Strategy Grid below and fill in the blanks to guide your decision making about your marketing strategy. Going through the boxes in each column against the 4 ‘P’s (Product, Place, Price, Promotion) of marketing in a formal way will help you build a coherent plan. You are going to be running a tight budget and so ask yourself, what is the least expensive way that the strategy can be achieved at each step of the process, as you translate the strategy into an actionable marketing and then promotional plan, through the Marketing Strategy Grid. In a small company, it is quite likely that there will not be a marketing manager. I strongly recommend that the top team and any relevant external advisers all contribute to the completion of the task, so that all are committed to the direction of the venture. But, there are so many marketing tools that you can use. Here’s a site that will give you a head start. One I have found to be especially helpful is Haikudeck. It’s essentially a way to make slides. It’s based on the idea of a Japanese haiku that gets a message across very succinctly. It is a boon to me because it obliges me to reduce my message to the essentials. Try it. Take a look at the other Venture Founders Tools—you may find more than one that will help you in thinking trough the Marketing Strategy Grid for your own enterprise.